There's finally been enough time to get started reading the new edition. Cover - I'm still undecided about the cover. It is quiet good fantasy art, but is it D&D? The fire giant on the cover is far too large unless they are going to radically increase the the size of giants in the new monstr manual. Fire giants have always been about 12' tall and this one is at least 30' tall. I know I'm nitpicking, but having seen far too many manga-esque drawings in which ordinary humans are shown using giant swords that would weigh more than they do, any exaggeration of size seems silly. The text on the back cover is simple and enticing - no problems there. And the odd smooth to rough transition on the back cover is noticeable, but really unimportant. Cost - $49.95 for 328 pages (counting covers and blank pages). Ouch! If anyone wonders why it's so difficult to recruit new players, the rather steep entry fee might be a factor. Binding - Having had more than one game book fall apart after heavy reading, I've started to appreciate quality binding. Although only time will determine how well it lasts, this seems to be exceptionally well bound and unlikely to fall apart. Preface - There's not too much to say about a preface, but with quotes like "collaborative creation," "create epic stories," and "strengthen friendships" in the text, it's clear the game is again on the right track. D&D isn't a video game; it's better than that, and should emphasize it. Introduction - It's difficult to remember not knowing what a role-playing game is, so it's really impossible for me to judge how effective the introduction is at explaining this. It seems to good with one exception. The overused, and frankly insulting, comparison to "childhood games of make-believe" serves no positive purpose and gives outsiders a completely wrong idea of what gaming is. Gary Gygax and Dave Arneson weren't outside playing a fantasy equivalent to "Cowboys and Indians" and decided to make some rules to see who fireballed who first. absurd. It is wargaming with elements of theatrical method acting and collaborative storytelling mixed in, the proportion of each of these varying from group to group. Still, despite that pet-peeve, the introduction seems pretty good overall. Step-by-step characters - As the title notes, this small section gives an overview of the steps in creating a character. There's nothing unusual here and each step is covered in more detail later in the book. Races - Here we start getting to the meat of the book. All the old races from 1e are here, although gnomes half-elves, and half-orcs are considered "uncommon." There are only two "new" races, and both have appeared before. Tieflings have been around so long that they are almost "old school." I don't really care much one way or another about them, though it is interesting that they made it into the core and aasimar didn't. And unfortunately, dragonborn did make it into the latest edition. This race has always seemed to be little more than munchkin bait for those who want a character who has a breath weapon. Although an exceptional role-player could turn one into an interesting character, far more if these will be played walking flame (or acid, lightning, ect.) throwers. One thing I really like about the races is that there was clearly an effort made to make each race feel different through descriptions and rules. With different traits, as well as stat bonuses, each race is subtly different and has its own flavor. While I do gave a few curmudgeonly complaints, so far this new edition is quite impressive and a vast improvement over the fourth edition. Now available at DriveThruRPG, "FM-1: Baba Smerta" This mini-adventure is a "pay what you want" product with a suggested price of only 50¢ but 0¢ is fine. It is also available at RPGNow. "As night falls on the marsh and the fog blankets the land, the people of the surrounding villages lock their doors and pray that they will be overlooked by the minions of Baba Smerta. For nearly three generations they have suffered her tortures and humiliations. When one of her raiding parties takes on the PCs, though, have they bitten off more than they can chew? Will this long reign of terror finally come to an end? 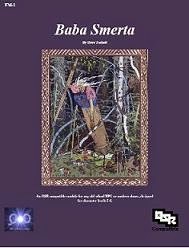 An OSR-compatible mini-module for any old school RPG or modern clone, designed for character levels 5-6, "Baba Smerta" is easily adaptable to other levels"
The informal review of the 5e Player's Handbook has been delayed slightly, but will start soon - I hope. With all that's been going on, I've neglected to mention QuasarDragon Games' sister site QuasarDragon. QD is an on-again, off-again website that has been linking to free, legal fantasy, science fiction, and horror since 2007. It's from there that QuasarDragon Games gets its name, not the "Shooting Quasar Dragon" card from Yu-Gi-Oh!, which came later. If you like those genres (are there any gamers who don't like at least one of them?) feel free to check it out. 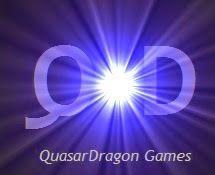 QuasarDragon Games third product should be out in the next week or so. This, as of yet unnamed OSR mini-module will be very inexpensive. 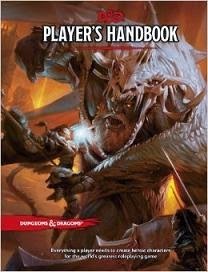 And starting this weekend, I'll be posting an informal multi-part look at the Fifth Edition D&D Player's Handbook. And QuasarDragon Games' first product, The Treatise of Twisted Terrors, has just been reviewed at OSR News and Reviews and I'm dancing such a happy jig that you'd have to save vs insanity if you could see me. The pleasant town of Sligo has its tranquility shattered when a young boy vanishes in the middle of the night. Investigating the disappearance, the characters discover lost ruins and an ancient plot for revenge and a long forgotten enemy of humanity. Will the characters be able to rescue the stolen child or will a cruel, wronged race be able to wreak vengeance on all humanity? An OSR compatible module for any old school RPG or modern clone, designed for character levels 7-9, The Stolen Child is easily adaptable to other levels. Sorry, no posts for a few days due to a death in the family. For I've turned the final bend. As the road comes to an end." QuasarDragon Games first OSR adventure, PO-1: The Stolen Child, should be available within a couple of weeks or so, barring unforeseen disaster. It will be available at DriveThruRPG and RPGNow, most likely as a pay what you want item. In the meantime, here's a rather silly monster for any OSR game systems. "What a strange creature it was. When I first saw it, I thought it my be a deformed bear, or one that was horribly scarred. That was soon disproved when poor Arteoss decided to chase it off with his slingshot; it seems unlikely that he'll ever regain use of that eye. Who'd have believed that the stone would bounce of the damned beast and rebound straight back at Arteoss." - from The Journals of Eurylochos the Traveler. 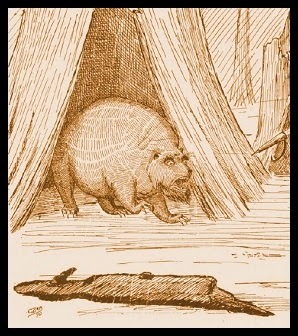 Gumberoos are a strange species of bear that inhabits coastal forests. They look much like an obese, mostly hairless black bear, with bushy eyebrows and scraggly chin hairs. Aggressive beasts, gumberoos will attack almost anything when it is away from its lair, not from maliciousness but because it has an exceptional appetite. Gumberoos are immune to all non-magical weapons which bounce off its hide and invariably rebound toward the attacker. This innate magical ability causes the attacker, such as a player character, to effectively attack themselves. (Whatever number the player rolled to attack the gumberoo is used on the attack against themselves. Strength and other bonuses do apply.) For each attack, magical weapons have a 25% chance of rebounding, as do magic missiles (roll for each missile). Because of this ability, gumberoos have no fear and will charge anything that looks edible. This creature has one fatal weakness, though it is often dangerous to exploit. If a gumberoo is damaged by fire for more than one point, it explodes in a flaming inferno, exactly as if a fireball cast at eighth level had detonated where it was standing. Gumberoos spend most of their time sleeping at the base of burned out trees, typically cedar trees. The rest of the time they are out hunting or following other biological urges. They are voracious eaters and can eat prey larger than themselves, sometimes stretching to to ridiculous proportions to consume it all. QuasarDragon Games will soon be releasing our first adventure, PO1, but in the meantime, here is a new monster for any old school role-playing campaign. It may or may not appear in any future QD products. In addition to the normal open game content usage, you may use the text and art, if you like, as long as you give me (Dave Tackett) credit and provide a link to Quasar Dragon Games. "Swift as the word, she sped the boar away, / With charge on those devoted fields to prey. / No larger bulls th' Aegyptian pastures feed, / And none so large Sicilian meadows breed." Ovid - Metamorphoses. First sent by the the goddess Artemis to lay waste to Calydon in Aetolia after its king neglected to honor her, the calydonian boar was killed, but could easily be recreated by her or any other vengeful deity. The size of a large rhinoceros, this boar is destruction incarnate. It exists to destroy anything and everything within its range, starting with animals, but sparing neither plants nor man-made objects. It does not eat, drink, or sleep. 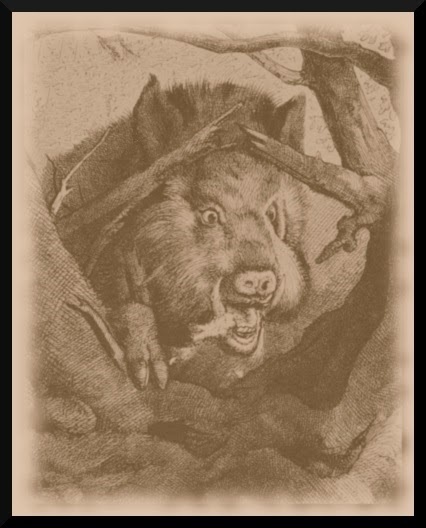 The calydonian boar can only be hit by weapons of +1 or greater, regenerates 3 hit points per round, and is immune to spells that target "animals" as well as all mind influencing spells (Charm, Sleep, Hold, etc.) except illusions. The boar is immune to natural fire and takes only half damage from magical fire. It can breathe fire, but does not use this ability in combat, using it only to destroy crops and buildings. The original calydonian boar was slain in a great hunt in which many of the great heroes of the time took part. This could be recreated to allow the PCs to meet potential friends and rivals. Original art by Fedor Flinzer, modified by Dave Tackett. All monster statistics are Open Game Content, including, but not limited to, the stat block from “frequency” through “source.” All references to spells, and other pre-existing open game content referred to in the text is Open Game Content. 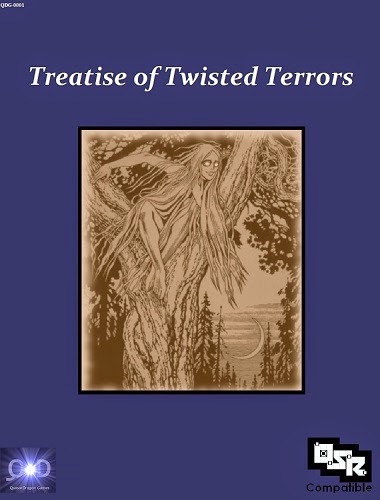 The Treatise of Twisted Terrors is an unofficial supplement for old school renaissance role-playing games and can be used with any old school RPG or modern clones. It contains seventy new and re-envisioned monsters for your campaign. These monsters are from the myths and legends of numerous cultures to bring new challenges to players, both experienced and novice. This is an OSR Compatible product. Available at DriveThruRPG for only $2.00! Below are three monsters that were rejected form the Treatise of Twisted Terrors due to a lack of available public domain art. The formatting is a bit different online, but not too different from the supplement. All open game content may be used as allowed by the Open Game License. The text descriptions may be used as long as credit is given (preferably with a link here). “Ugly, suspicious, and downright weird, the hoppers were nonetheless good friends in our travels through their lands. In exchange for a few trade items, they acted as guides and guards, quickly leading us through what would have otherwise been very treacherous wilderness. I’m glad we met them, but I’m still having nightmares of their bizarre hopping and hooting calls” - - from The Journals of Eurylochos the Traveler. Weird, froglike humanoids, armouchiquois stand about three feet tall and have disproportionately long legs. They are surprisingly strong, equal to an ogre, and this, along with their long legs, allows them to hop great distances. They can hop as high as ten feet. They have a sallow skin color and sunken, nearly skeletal facial feature. All told, they look like small, sickly, frog-men. Despite their unintelligent appearance, they have surprisingly strong mental powers, leading many to become magic users, illusionists, bards, and other spell using classes. They tend to live in isolated clans, far from large scale civilizations. Although they seek little contact with other races, through trading they will have weapons and armor similar to neighboring peoples, most typically spears and short bows. Armouchiquois are likely to be allies, trading partners, and/or sources of information. They may well be the only demi-humans in large territory controlled by hostile humanoids (orcs, gnolls, etc). Unknown even to them, armouchiquois are a sub-species of human and are therefore subject to any spells that effect typical humans. Roughly 5% of them will have class levels, typically being low-level magic users, similar intellect based classes, or rangers. “The weird, grass-man had attacked a lone scout, apparently underestimating her combat skill. It did not live long enough to be questioned.” - from The Journals of Eurylochos the Traveler. A bizarre, cannibalistic humanoid race, the eloko are dwarf sized, but instead of hair, they have grass growing all over their bodies. Their snouts are elongate with prominent, sharp teeth, causing them to look a bit like mammalian kobolds with grass for fur. They reside in deep forests and dress in clothes made out of leaves. The most potent weapon possessed by the eloko are their charm bells. These magic items can be used to cast a potent charm spell two times a day. This functions as the magic user spell charm person, but with one important difference. Victims charmed by the eloko bell will do anything the caster asks, typically allowing the eloko to eat the alive. They have one charm bell per 10 eloko or fraction thereof. Eloko subsist on forest game and rare forest fruits, especially berries, but prefer human meat when they can get it. Eating the flesh of sentient beings is so important to the eloko that they will frequently deny having eaten anything else. Eloko are another race that can help add an element of the exotic to distant regions. In their home region, they may fulfill a role similar to that of orcs or goblins elsewhere but they act and feel quite different. “I’ve always been a bit leery of snakes and when one rose up on a pair of hind legs and hissed something at me, I reacted without thinking and kicked the damn thing as hard as I could. Fortunately my boot was heavy enough that it smashed in its head. When I took the corpse over to Peiraios’ tent to see if he knew what the creature had been, I could not wake him. He had been bitten by this creature, or as I fear, another of its kind.“ - from The Journals of Eurylochos the Traveler. The attercroppe (“little poison head”) is a small poisonous fairy-snake with humanoid limbs and an insatiable cat-like curiosity. They are extremely malevolent towards humans, humanoids, and demi-humans, except for elves and fairy folk of all kinds. A nocturnal creature, they tend to sleep through the day in their small boroughs (indistinguishable from normal snake holes on the surface). They live near rivers and in forests where other fay beings live. An unarmed human will almost certainly be bitten (save vs poison at -1 or die) unless they can distract them long enough to flee. The best way to distract an attercroppe is to toss an unusual or shiny object to it, which should give the person a few seconds to hastily exit the area. Attercroppe are minor, but dangerous nuisance encounters for characters travelling through darker fay lands. Of course, if one of the characters, or better yet players, has a snake phobia, then they might be a more common monster. Experienced adventurers will often leave out many worthless shiny baubles to distract these unseelie fairies. Either the attercroppe will run of with some of the “treasure” or it will be mesmerized by all the fascinating items. Either way, it’s better than being bitten in your sleep. All text descriptions of the creatures are Product Identity to the extent permitted under the OGL and to the extent such material is subject to copyright, except for any text language derived from the SRD which is Open Game Content. The phrases “The Journals of Eurylochos the Traveler,” is Product Identity. 1. Definitions: (a)”Contributors” means the copyright and/or trademark owners who have contributed Open Game Content; (b)”Derivative Material” means copyrighted material including derivative works and translations (including into other computer languages), potation, modification, correction, addition, extension, upgrade, improvement, compilation, abridgment or other form in which an existing work may be recast, transformed or adapted; (c) “Distribute” means to reproduce, license, rent, lease, sell, broadcast, publicly display, transmit or otherwise distribute; (d)”Open Game Content” means the game mechanic and includes the methods, procedures, processes and routines to the extent such content does not embody the Product Identity and is an enhancement over the prior art and any additional content clearly identified as Open Game Content by the Contributor, and means any work covered by this License, including translations and derivative works under copyright law, but specifically excludes Product Identity. (e) “Product Identity” means product and product line names, logos and identifying marks including trade dress; artefacts; creatures characters; stories, storylines, plots, thematic elements, dialogue, incidents, language, artwork, symbols, designs, depictions, likenesses, formats, poses, concepts, themes and graphic, photographic and other visual or audio representations; names and descriptions of characters, spells, enchantments, personalities, teams, personas, likenesses and special abilities; places, locations, environments, creatures, equipment, magical or supernatural abilities or effects, logos, symbols, or graphic designs; and any other trademark or registered trademark clearly identified as Product identity by the owner of the Product Identity, and which specifically excludes the Open Game Content; (f) “Trademark” means the logos, names, mark, sign, motto, designs that are used by a Contributor to identify itself or its products or the associated products contributed to the Open Game License by the Contributor (g) “Use”,”Used” or “Using” means to use, Distribute, copy, edit, format, modify, translate and otherwise create Derivative Material of Open Game Content. (h) “You” or “Your” means the licensee in terms of this agreement. 9. Updating the License: Wizards or its designated Agents may publish updated versions of this License. You may use any authorised version of this License to copy, modify and distribute any Open Game Content originally distributed under any version of this License.